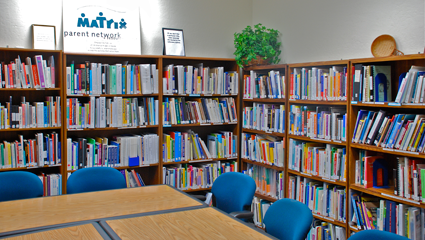 Our library is located in our office in Novato. Materials focus on special needs topics, child development, and parenting. Click here for a listing of categories.The libraries include a selection of books, journals, and audio-visual materials. We also have books for children and teens as well as a Spanish language section. Most items are available for checkout with a deposit.We welcome donations of materials! This is where all of our Novato trainings are held. 220 BUD – Living with the Active Alert Child by Linda S. Budd, Ph.D.
350 WOO – S.O.A. R Study Skills by Susan Woodcock Kruger, M.Ed.